Microsoft just announced that it’s buying LinkedIn for a whopping $26.2 billion, and it’s as good a time as any to remind yourself that there are some things you just shouldn’t do on LinkedIn. Kim Brown is an assistant director for Syracuse University’s Career Services department. She spends a good portion of her day looking over LinkedIn profiles for job seekers and students. She makes sure candidates are putting their best foot forward on LinkedIn. Brown says she's spotted typos in company names, job titles, and even in the user's name. Unfortunately, LinkedIn doesn't have a built-in spell checker, but your browser might. Safari, Chrome, and Firefox underline misspellings in red. Bottom line, whatever you use: Be as careful on LinkedIn as you would be with a paper resume. Brown recalls one student who came to her, frustrated because he couldn't find a job. When she checked out his LinkedIn, she saw that he had chosen a photo of himself doing The Chicken Dance at a wedding. Oof. Stereotypical, duck-faced selfies are another big no-no that Brown's started noticing more often. You can now add a background photo to make your profile stick out, too. You should pick something that matches your brand, Brown says -- for example, hers is of the SU campus -- and make sure that your file is big enough that it doesn't end up looking stretched and pixelated. 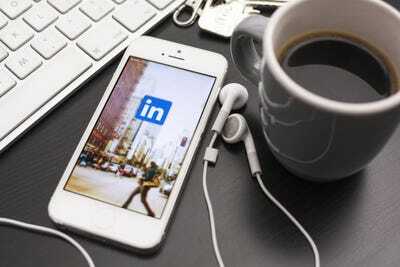 LinkedIn also allows you to upload all sorts of rich media -- like documents, photos, links, videos, and presentations -- to your profile, and if you don't take advantage of that you're missing out. Brown says she sees a lot of people simply put 'Student at X University' as their lead LinkedIn headline. She also sees a lot of professionals who are looking for jobs with old titles as headlines. You have a lot of room to be descriptive in this area of your profile! 'If you're a job seeker and you have a (vague or outdated) title, I have no idea you're looking for work,' says Brown. So, it's better for a student to write that they're an 'Advertising major at Syracuse University who has experience with nonprofit work' or for a job seeker to write, 'Experienced advertising professional looking for a opportunities in the med-tech space.' Her official job title comes in the 'Experience' section of her profile. Never, never write 'unemployed' -- highlight what you're looking for, instead. Take a few moments to write something personalised, says Brown. It will make the recipient more open to your request and the message feel less spammy. 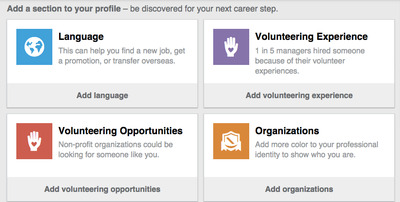 LinkedIn's now has a whole suite of useful apps. The flagship lets you connect to people with a click -- but you can't customise the message. You also run a greater risk of typos on your phone though. 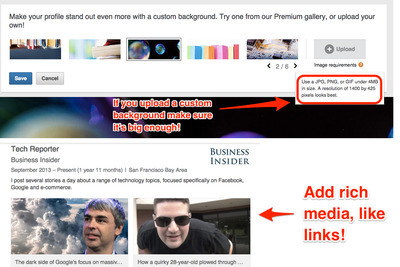 To customise your LinkedIn URL, press the 'Edit Profile' button. Click the gear symbol next to your URL, which will take you to a separate page where a 'Your public profile URL' box will let you change the link. Try to get as close to your first and last name as possible. Avoid cutesy nicknames or usernames. 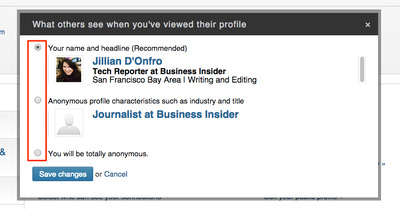 Any LinkedIn user can see who's viewed their profile recently, but if you limit your public profile settings, less of your information will be revealed to the person you've checked out on LinkedIn. 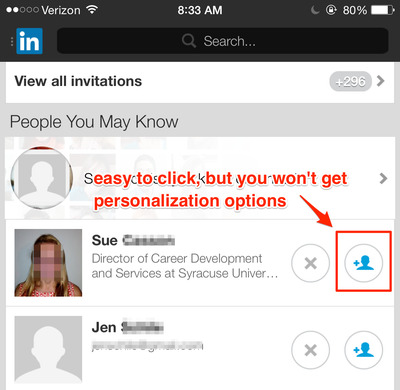 The trade-off: You won't see as many details about who's visiting your profile, either. It's not just about your summary and work experience: You can add volunteering experiences, organisations you're part of, honours you've received, projects you've worked on, and more to your LinkedIn. 'Don't be afraid to play around with the order of the sections,' Brown says. For example, if you're a recent grad and your course work is more valuable than any of your previous jobs, drag the 'projects' section above the 'experience' section. Adding a bunch of skills to your profile is a good way to easily flaunt your chops and make yourself more searchable, but if you write something obscure that LinkedIn doesn't recognise, it doesn't do you much good. Brown says it's important to have recommendations on your LinkedIn profile. But not just any old recommendation -- it should come from someone who's reputable and it should speak to your specific qualifications. Getting these recommendations may require asking for them. Navigate to the 'Privacy and Settings' tab, then to 'Profile,' and you will see a link for 'Manage my recommendations.' 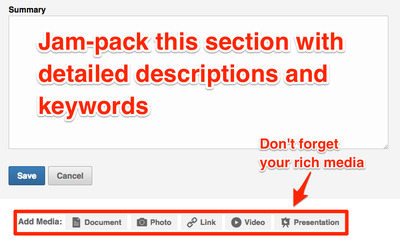 That section will prompt you to send a message to a boss or coworker. More than ever before, the site makes it easy to keep your network up-to-date on what's going on in your professional world through updates, photos, posts, and comments. 'The 'Keep in touch' section is a lazy networker's dream,' Brown says. Under the 'Connections' tab, LinkedIn makes it dead simple to find little ways to connect with people in your network. You can see congratulate someone on a work anniversary, new job, or switching cities. Every time you connect with someone new on LinkedIn, you should get into the habit of feeling out information in the 'Relationship' tab that will appear on their profile. 'Don't worry, it's only visible to you,' Brown says. 'This is one of the biggest 'a-ha' moments that everybody has when I teach LinkedIn classes,' Brown says. Recently, LinkedIn has really amped up the way it lets you find people who went to your university. You can see all the people who attended your college who studied a certain major or were in your year. You can even search for a specific company, and see all the alumni who worked there. This is great for networking, reconnecting, or planning reunions. 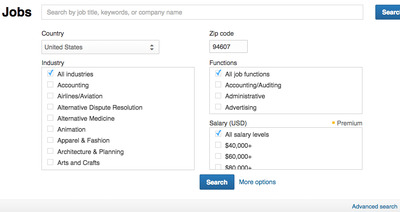 You can also save searches, save jobs you're interested in, and even apply, right through the site.